Ginger Zee, ABC News Chief Meteorologist, will be signing copies of “Chasing Felicity Into the Wind” in NJ during April. Ginger Zee is the Chief Meteorologist for ABC News, forecasting for and reporting on the nation’s weather from Good Morning America to World News Tonight. Zee has been on the ground before, during and after almost every major weather event and dozens of historic storms including Hurricane Katrina. She watched as the eye of Superstorm Sandy passed over Atlantic City and then covered the devastated Jersey Shore; she was there for the Colorado floods and wildfires; and the destructive tornadoes in Moore and El Reno, Oklahoma. Zee’s dedication to science began at an early age, watching powerful thunderstorms rush across Lake Michigan. Her passion for meteorology brought her to stormchase in college at Valparaiso University where she earned her bachelor of science in meteorology. Throughout her career and especially in this book, Zee is dedicated to getting young people interested in science, respecting the environment and atmosphere around them. When Helicity Dunlap flies for Texas to spend time with her best friend Mia she hopes to leave the tragedies of the devastating tornado and flash flood back in Michigan-at least for a little while. Her responsibilities at Mia’s Aunt Suze’s beachfront bed and breakfast are pretty simple and leave her lots of time to enjoy hunting for sea glass, sunbathing, and exploring a summer romance. But Helicity comes by her name honestly-Helicity means to spin-and her troubles from home follow her south. Her concerns about her older brother Andy intensify-even though he shows up to surprise her in Texas. And if there’s one place in the world that has weather to rival Michigan’s, it’s Texas. 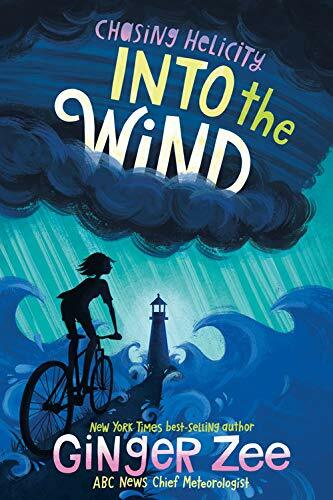 She and her friends go out for a day sail and get caught up in a derecho-a line of intense, widespread, and fast-moving windstorms that once again turn her boat-and life-upside down. She’ll have to face her fears and muster all her strength and knowledge to fight her way out of the nightmare.